Taken 13/09/17: No. 46447 was built in 1950 at Crewe and successively allocated to Crewe North, Workington Springs Branch, Llandudno Junction, Bangor Nuneaton, Derby and back to Springs Branch from where the loco was withdrawn in December 1966 and sold to Woodham Brothers of Barry for scrap. From Barry the locomotive was purchased by the Ivatt Trust and moved to Quainton on 7th June 1972. "A ground-breaking loco exchange deal has been completed between the ESR, the Isle of Wight Steam Railway and E1 locomotive owner Mr Richard Bellchambers that will see the return to steam of two historic locos. The deal is tremendous news for both railways who have been congratulated on achieving a possibly unique agreement that will benefit the wider heritage railway movement. The E1 has gone to the island, which has been an ambition of the IWSR for a long time and the ESR has taken delivery of Ivatt class 2MT 2-6-0 46447. 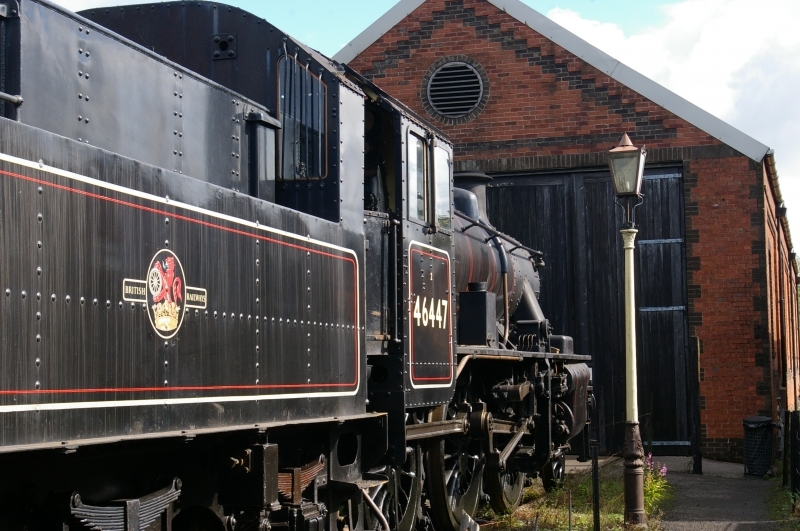 The Ivatt will continue to belong to the Isle of Wight Steam Railway after being generously donated by the Ivatt trust along with the two Ivatt tank engines. The locomotive has not run since B.R. days and will be restored by the workshop team at Cranmore before it will return to service pulling trains at the E.S.R. The deal ensures the ESR will have full use of the loco for at least the next 10 years. A generous bequest to the Isle of Wight Steam Railway is funding the deal including the restoration of the E1, and in accordance with the wishes of the benefactor, it is expected it will run in the guise of No2. `Yarmouth` at the IoWSR. Ivatt 2 tender locos were commonly found on the Cheddar Valley line in B.R. days and so will be representative of the motive power once in use here at the ESR. 46447 has already entered the workshops at Cranmore and work has started on the overhaul."